IT Asset Management is often considered as a low-grade task. But unknown to many folks ITAMS is a crucial function of organizations and must be given the highest possible importance. IT Asset Management is often considered as a boring and low grade task by many technical executives, CTOs and even CIOs. This is because most technical staff in many organizations hates getting involved in the commercial and financial aspects of managing IT assets as they think this is just a glorified storekeeper job. Such misconceptions result in frequent battles between the finance, audit, and the technical departments. However, IT asset management is an extremely crucial function of any organization, and must be given the highest importance possible by the senior management. An IT asset manager’s job is a powerful position that can help organizations to save costs, ensure material discipline, offload asset activities from technical staff who may not be qualified or interested in doing such activities, ensure physical and data security, help in budgeting, and supervise the complete lifecycle of IT assets used in an organization. Secondly, it’s not a mere storekeeper’s job as many executives fear and this book will show you how and why. Feel free to visit his web cave www.thejendra.com for details of his books and magazines. What is an IT asset? 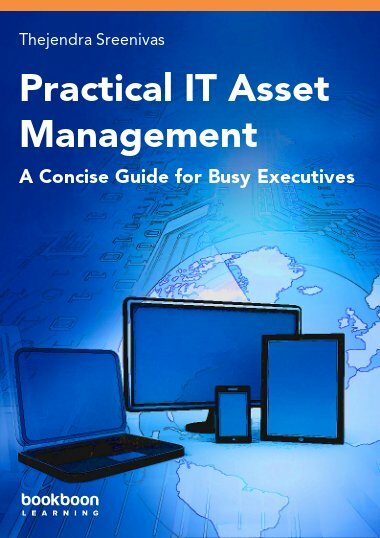 What is IT asset management (ITAM)? What are the benefits of IT asset management? What are the risks of not having an IT asset management? What is an IT asset lifecycle? What IT asset teams will NOT do? Who are the real owners of IT asset management? What is an Asset Tracking Tool? How to gather requirements for the tool? What are Asset and Finance IDs? Team and Software are ready. Now what? How to begin populating the database? What is an IT Asset Policy? How to manage Software Assets? What are the responsibilities of a SAM Team? What are the types of Software Licenses today? Was it a Boring Job?